Eating at the Brauhaus is kind of like being a guest at the Madhatter’s tea party held in the middle of a giant cuckoo clock. And also, inevitably, you’re drunk. While we were there, the live band played Happy Birthday about 45 times and each time, the entire place sang along with undiminished enthusiasm, their huge glass steins swaying precariously overhead. A little background: Lincoln Square is a quaint Chicago community that was originally settled by German immigrants whose heritage is still evident in the handful of German bars in the area, as well as the biannual festivals (which are, by the way, a blast despite -or maybe because of- the debauchery). In case you’re wondering, my favorite Lincoln Square German bar is the low key and admittedly crappy (but charming) Hansa Clipper, which is nothing like the bustling Brauhaus. 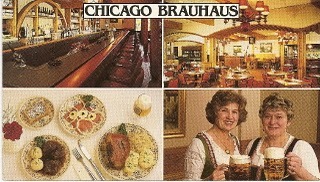 Brauhaus is a destination, much like Munich’s Hofbräuhaus (and nothing like Chicago’s whitewashed version). 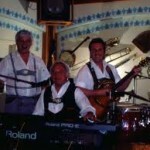 You go for the kitsch… for the polka and the lederhosen and the boots full of beer. Basically, it’s nonstop Oktoberfest. The menu features traditional German dishes like bratwurst, schnitzel and sauerbraten. In other words, it is, like most Bavarian fare, a sausage fest. Vegetarians should not come hungry. Brauhaus does serve delicious hot pretzels, served with hot German mustard and horseradish and, if you ask nicely (it’s not on the menu) a vegetarian main course, which is basically just spätzle (egg pasta mini-dumplings) with a variety of cabbage-themed sides. Driven by desperation, I ordered the jalapeno poppers. Why these are on the menu, I do not know. My advice: stick to the German standards. Other than that, I’ll leave the food recommendations to my husband since my choices were limited. I’m interested to see what he remembers after his boot full of Spaten. 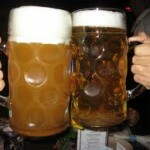 My advice is to enjoy the Brauhaus for the fun-filled spectacle that it is. 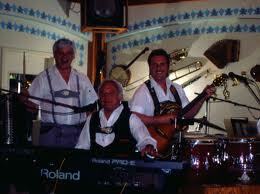 Don’t take yourself too seriously – just grab a something-wurst, wash it down with a uberstein and get your polka on. Prost! 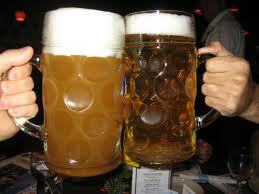 The boot is huge, probably three times the size of one of their steins. And I should know, because I finished one stein before I decided that the boot was a good idea. I wasn’t sure if I could do it, but with grit and determination, I finished that bootofbeer (that’s right, one word). It’s quite an accomplishment. In fact, I’d dare say it was my greatest accomplishment of 2010. And I got married this past year. So you’ll have to excuse me if I don’t have a lot to say about my meal. With all the excitement about the bootofbeer, there just that wasn’t much to remember about my meal. I had the Kohlroulade, which is a cabbage stuffed with ground pork, beef and veal. It wasn’t bad, just very bland. But it isn’t about the food, it’s about the experience. And with the polka music, the festive decor, and the bootsofbeer, I’ll definitely go back. In fact, I already did. The next day I made a trip to see if I’d left my credit card there.